Engineering and computer science students work on a drone inside a laboratory in the Education Building on The University of Texas at El Paso campus. Unmanned aerial systems (UAS) experts from UTEP's NASA MIRO Center for Space Exploration and Technology Research (cSETR) have leveraged the efforts of 30 computer science and electrical and mechanical engineering students to develop very long range unmanned aircraft systems technology. Engineering and computer science students have had a hand in The University of Texas at El Paso's ascent to the forefront of unmanned systems technology. Unmanned aerial systems (UAS) experts from UTEP's NASA MIRO Center for Space Exploration and Technology Research (cSETR) have leveraged the efforts of 30 computer science and electrical and mechanical engineering students to develop very long range unmanned aircraft systems technology. Since January 2018, cSETR has led a team of leaders from El Paso County, the City of El Paso, El Paso International Airport and many other regional government entities in a partnership with California-based AirMap, a global airspace management platform for drones, for the system's implementation. The system initially became operational in March, tracking all participating manned and unmanned aircraft. The system will be fully operational by the end of the summer, tracking cooperative and uncooperative manned and unmanned aircraft. The students' work has been vital to the overall effort, which is geared toward enhancing public safety, said Michael McGee, Ph.D., cSETR senior research associate. 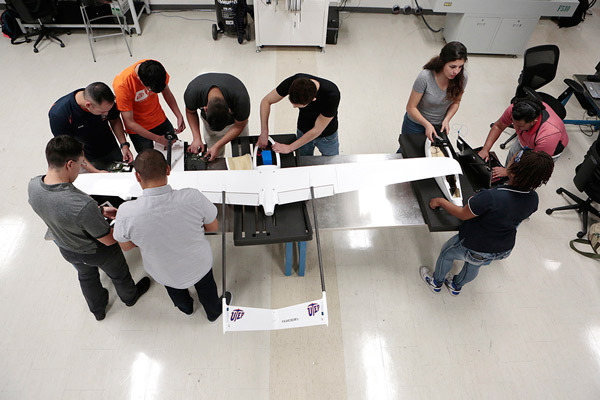 "This team of faculty and students from many different disciplines within UTEP is on the leading edge of the unmanned aviation industry," McGee said. "The capability of the unmanned systems they are developing is absolutely impressive and is more advanced than any systems available commercially. Their work is establishing UTEP and El Paso as a national leader in this new industry." "It's an honor, for sure, to be able to participate in a project such as this one," said Cesar Valenzuela, a senior electrical engineering major. "It's one of the greatest things I've ever done as a student." "It's nice to be working with other departments besides electrical engineering," Valenzuela said. "We're learning to collaborate, communicate and coordinate in order to achieve a common goal, which is flying the drone." "I think that there's a lot of new development and improvement in the aerospace industry," Villela said. "I think that's why a lot of mechanical engineers tend to be a part of the cSETR program. They want to be a part of the difference it is making in this world. I think it's a great experience to have some hands-on work. I really like designing, manufacturing and being able to create something that the drone needs. It is something that is going to make an impact." "Through the UTM, we get experience in a real-world project. That's a plus," Lopez said. "This experience will help me in my professional career. It has exposed me to things I wouldn't have been exposed to." "The efforts to develop advanced capability long-range and long-endurance drones to support research and the further implementation of the area unmanned traffic management system will continue to accelerate at UTEP," McGee said.